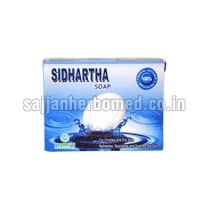 Sidhartha Soap that we offer is highly effective in providing relief from pimples and dry skin problems. Our Sidhartha Soap is appreciated for its zero side effects as it is hypoallergenic in nature. Its excellent medicinal values help in protecting the skin from irritations, itching, dryness and acne. Also, it is a good antiseptic. The natural herbs in our Sidhartha Soap stimulate circulation and help in eliminating the toxins imbedded in the skin while leaving behind a soft and smooth skin. It also moisturizes and revitalizes the skin while retaining its elasticity. Usage : Wash your face twice daily with Siddhartha Soap. Work up rich lather by rubbing the soap between wet palms. Using your fingertips, massage the lather into your face and throat. Rinse thoroughly with splashes of water. Blot dry with a soft towel.